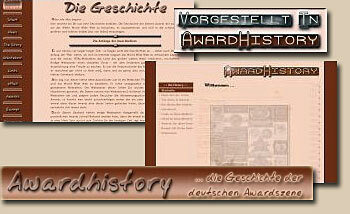 The idea to found a history and a collection of the best awardgraphics is nearly as old as the webaward itself. Here I like to introduce the former German projects. My sincere thanks apply to the owners of these projects named here! They all have supported me to carry on their ideas and they gave me the permit to use their material. Without these people, this project wouldn´t exist. I will try to continue it in their intention. Beside the mentioned there are many other people envolved in the former projects, they are included in my thanks. 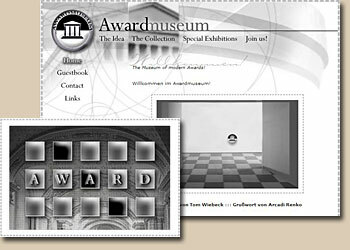 Already in the year 1999 Tom Wiebeck founded the first Awardmuseum. 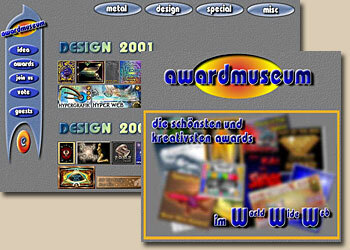 He operated it until 2001 and exhibited scores of special awardgraphics from these years. In addition, the designers were introduced by short interviews. Next Manfred Escher adopted the Awardmuseum in 2002 and opened it again with a new layout. A new design for the presentation was created, the collection increased continuously and new texts and prefaces were added. During a period specially outstanding graphics were prized monthly as "Award of the month" and introduced including the connected awardprogram by an interview. 2003 the museum was closed. The idea of a history as a platform to present projects connected to webawards was realized in 2002 by Stefan Hofrichter. 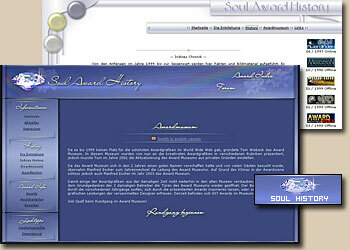 The story of the webaward since 1997 was told on these pages. Already existing and new founded awardindices were introduced, furthermore many other projects. The column "news" informed about any activity of the awardscene. Because of time reasons the project was unfortunately closed in 2003. 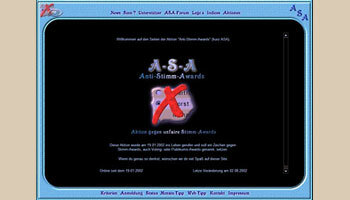 The awardhistory was continued by the campaign "ASA" [Anti-Stimm-Award, anti vote awards], which developed to a considerably offer of information about webawards. The owner was Thomas Willms. The focus of the history was continued and partially completed. Both the history and the awardmuseum opend again included in the Soul-Award-Index, founded 2005 by Thomas Willms and Birgit Blassnig. Also the awardlexicon, first created in ASA, was continued. Until the closing in april 2007 the history and the museum were currently updated and developed, then the Soul-Index went offline.